Swansea City Association Football Club är en walesisk fotbollsklubb från Swansea. Klubben bildades 1912 och har Liberty Stadium som sin hemmaarena. Säsongen 2007/2008 vann Swansea League One och spelade de följande tre säsongenerna i The Championship. Den 30 maj 2011 besegrade man Reading med 4–2 i den avgörande matchen i kvalet till Premier League inför 82 000 åskådare på Wembley. Kvalvinsten innebar att Swansea kvalificerade sig för Premier League säsongen 2011/2012 och blev första walesiska lag sedan 1984 att spela i den högsta divisionen. Long before Swansea Town came into being, children had played football on a piece of waste ground on which vetch - a cabbage-like plant used for cow feed - grew wild. Vetch Field, as it became known, was leased by the Swansea Gas Light Company to the Swansea League who laid out clinker pitches. In 1912, Swansea Town were formed as a professional club and took up residence. This was an ambitious venture given the dominance of rugby union in the area. The new football club adopted the same all white strip as Swansea RUFC and apart from a few seasons when black shorts were introduced, they have worn all-white for most of their career. 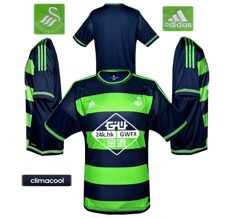 The club was known as Swansea Town but they changed their name when Swansea was granted City status in 1970. People born in the town (and by extension the fans of the football club) are known as "Swansea Jacks." According to theSwansOnline.net web site, there are two possible origins for this nickname. The first is a reference to the high reputation of local seamen ("Jack Tars") in the early nineteenth century. There was also a famous black retriever called Swansea Jack who rescued no fewer than 27 people from drowning in the River Tawe and Swansea Docks during the 1930s. The Swans were admitted to the Second Division of the Southern League and there they remained until they won promotion immediately before the First World War. As a result, they became founder members of Division Three when the Southern League Division was incorporated in 1920. They were a strong side in those days, winning promotion to the Second Division in 1925 as champions of Division Three (South). The following season they finished fifth in Division Two and reached the semi-finals of the FA Cup. During the 1930s the club's fortunes declined but they staved off relegation until the season immediately after the Second World War. They did not stay down for long, winning the Third Division (South) championship and promotion in 1949. They stayed in the Second Division for another sixteen seasons, reaching the FA Cup semi-final once [swansea city crest 1970] again in 1964. The Swans also enjoyed the first of many European campaigns in 1961 by virtue of winning the Welsh FA Cup, a competition they have won ten times to date. In 1965 Swansea slipped into Division Three and then Division Four in 1967. Hopes were [swansea city afc crest 1972] rekindled in 1970 when promotion was achieved. 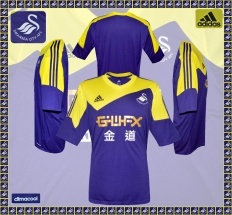 The following season the title "City" replaced "Town" and a black swan was embroidered onto the traditional white shirts. The shape of the swan changed somewhat in 1972 and then, in 1973, perhaps in a bid to gain wider [swansea city afc crest 1973] support across Wales, the swan was replaced by a Welsh dragon. The Swans were now back in the basement and in 1975 they faced the humiliation of having to apply for re-election. 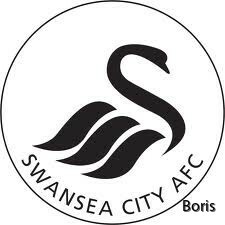 There followed a [swansea city afc crest 1975] remarkable revival under player-manager John Toshack, with successive promotions in 1978 and 1979 taking the club back into Division Two. In 1981, Swansea were promoted to the First Division finishing in a remarkable sixth place in 1982. The circular crest associated with that brief period of success in the First Division was adopted in 1975. The decline that followed was even more dramatic. Relegated in 1983 and 1984, Swansea City was formally wound up on 20 December 1985. Fortunately a group of directors put together a rescue package and permission was granted for the club to continue its fixtures. For 12 months the future of the club hung in the balance and, unable to sign or loan new players, Swansea were relegated to Division Four in 1986. However, the High Court finally approved the [swansea city afc crest 1992] [swansea city afc crest 1984] new board's rescue plan and Swansea City survived. Not only that, they won promotion to Division Three in 1988 and five years later reached the play-offs. The crest adopted in 1984 featured a castle, from the city coat of arms, as well as the familiar swan, now with outstretched wings. Two variations appeared in the Nineties before being replaced, in 1998, with an elegant, abstract design that proved far more enduring than any of its predecessors. [swansea city afc crest 1995] In 1996, Swansea were relegated to what was [swansea city afc crest 1998] now Nationwide Division Three (the old Fourth Division). Promoted as champions in 2000, the Swans lasted only one season at the higher level. During the 2001-02 season the club changed hands several times and was again on the verge of bankruptcy, narrowly avoiding relegation to the Conference in 2003. By 2005, however, there was a new air of optimism at the club as they prepared to leave the Vetch Field after more than 90 years to move into the new purpose-built Liberty Stadium. In 2008 Swansea ran away with the League One title and with it promotion to the Championship. 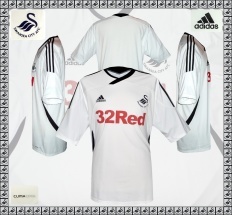 [swansea city cenenary crest 2012] After the team played in black shorts during 2009-10, the clubs supporters voted overwhelmingly for a return to traditional all-white the following season. Wearing a pristine Umbro strip, Swansea won through to the play-offs and beat Reading in the final to become the first Welsh side to play in the Premier League. Not bad for a club that had changed hands for just £1 a decade earlier. To mark their centenary, a commemorative crest was introduced for the 2012-13 season as well as a home strip trimmed in metallic gold. Their 100th season proved a memorable one: Swansea won the League Cup, their first major trophy, and finished in a comfortable ninth place in the Premier League.